The last time I wrote a blog was at the beginning of April. That is a long time ago for a blog, but the time has been filled to the limit. I won’t go into the intricate details, just enough to let you know what I have been doing. 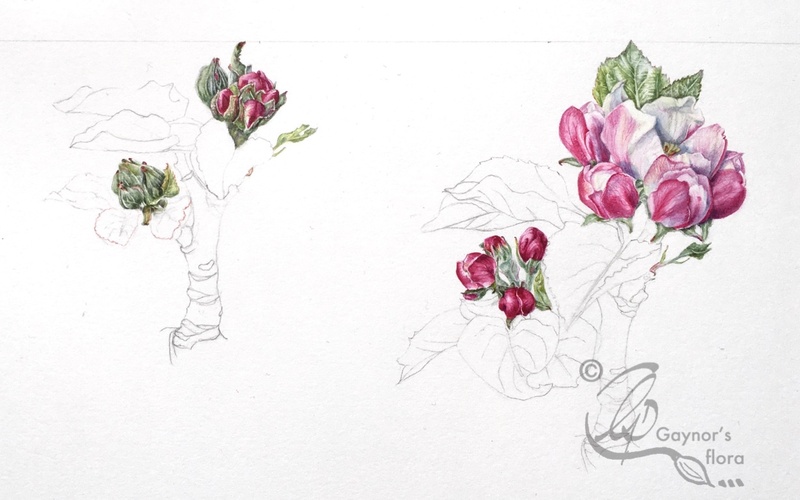 I don’t think I have mentioned in any great detail the formation of the Association of British Botanical Artists (ABBA), initially just to allow the UK (England and Wales) to participate in the Botanical Art Worldwide Exhibition. At the American SBA conference in Pittsburgh in 2016 we were faced with the possibility that the UK would not participate because we were all too busy! I couldn’t let that happen. In the end 25 countries took part. 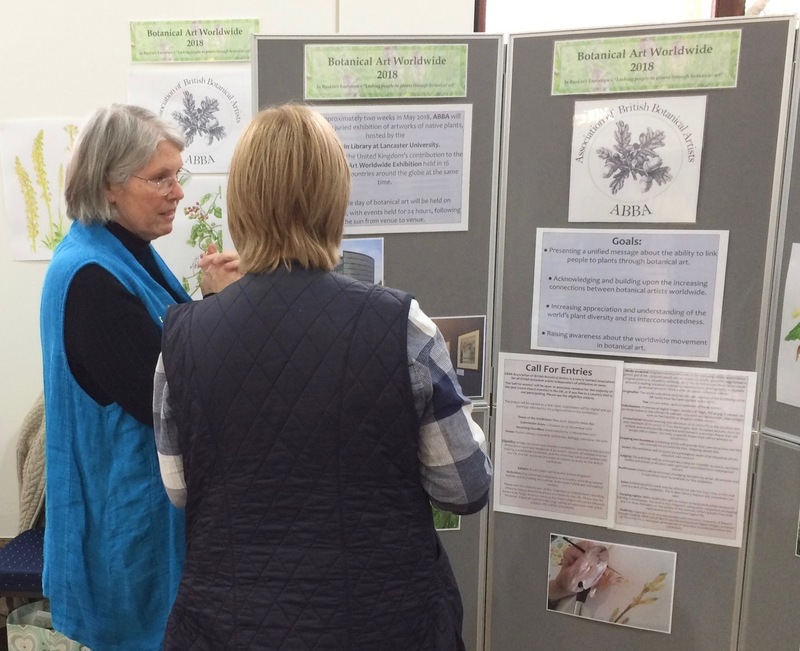 At a meeting back home in November, three of us met and agreed to form a steering group with me as main co-ordinator; we launched ABBA at the Royal Horticultural Society’s (RHS) Botanical art show in February 2017 and the process for participating in the Worldwide Botanical Art Exhibition began to take shape. 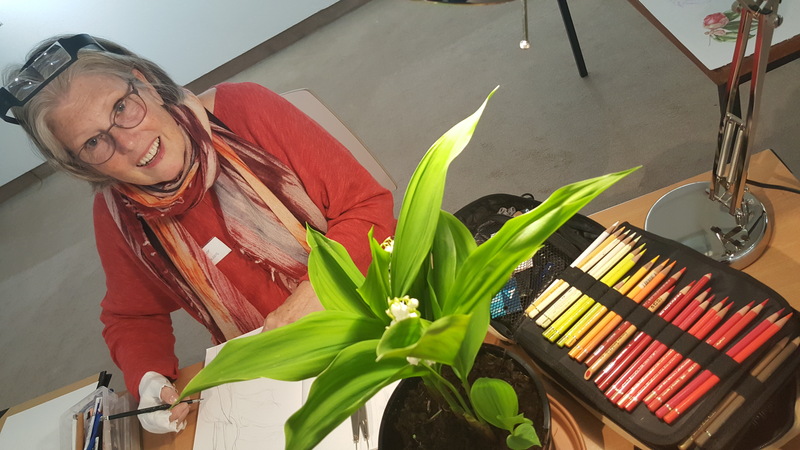 A few more botanical artists joined the steering group and we were away. We decided we wanted to hold the exhibition ‘up north’ as everything happens ‘down south’, doesn’t it? We found an exhibition space in Lancaster and ‘In Ruskin’s Footsteps’ (the name of the UK exhibition) started to develop. An RHS Dawn Jolliffe bursary was applied for and granted, so now we had something with which to pay for some of the things we had to pay for! 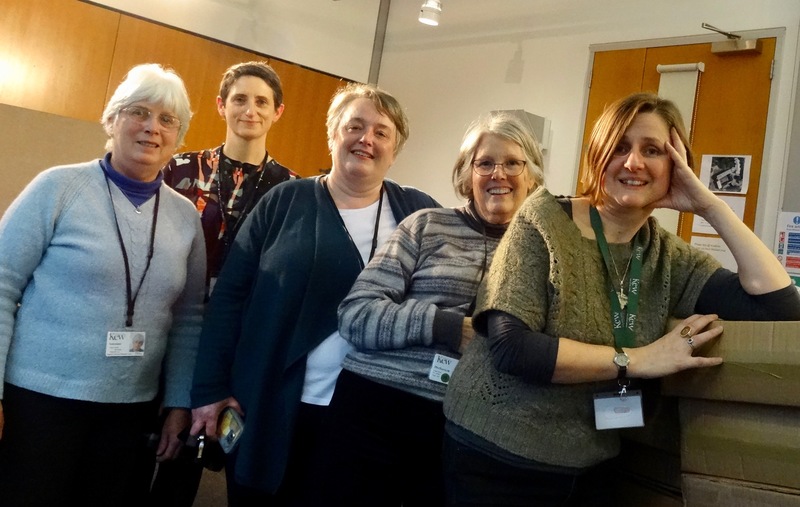 Packing after the judging: Christabel King, Deborah Lambkin, Sarah Morrish, me, Lucy Smith. 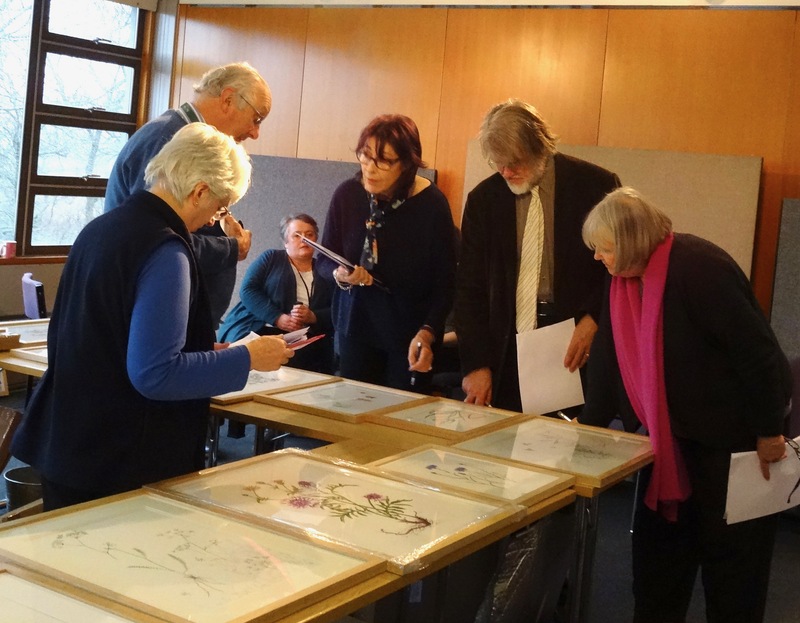 In November submissions of botanical art pictures arrived from all over the country and our amazing judges took care of that- initially digitally (with signatures removed) and the last phase ready framed at Kew in January. 40 beautiful pictures were chosen for the exhibition to be held 18th May to 9th June. 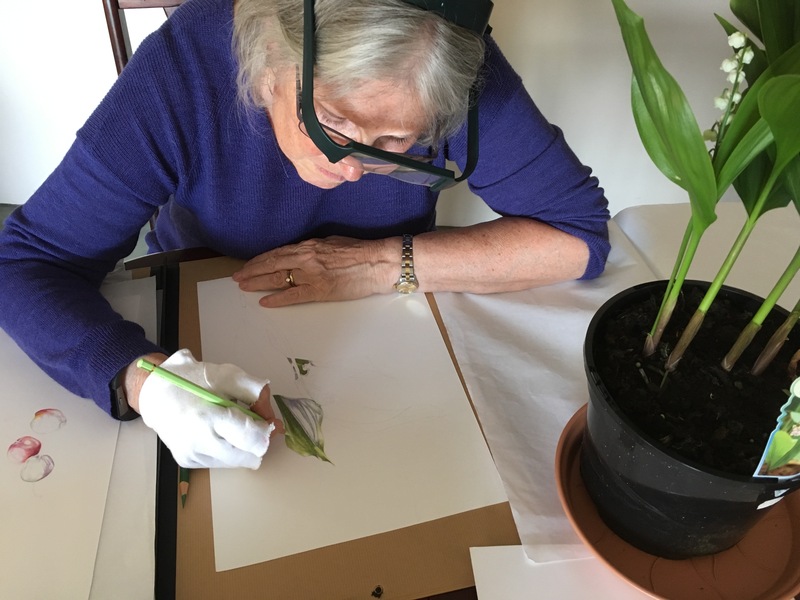 Several other institutions in London decided they wanted to work with us for the Worldwide Day of Botanical Art 2018, which was on 18 May. Therefore, together there was a lot going on behind the scenes on these events too. After some wobbles and lots of hard work, the time to set up the exhibition arrived, now to be held at the Peter Scott Gallery, Lancaster University. It is a fantastic exhibition space and people working there plus the previous curator at the Ruskin Library, were very helpful and supportive. 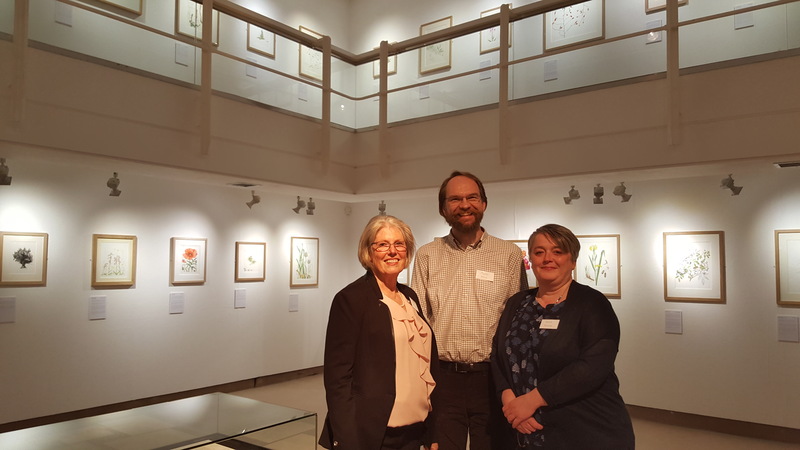 Worldwide Botanical Art Day in the Peter Scott Gallery at Lancaster University. 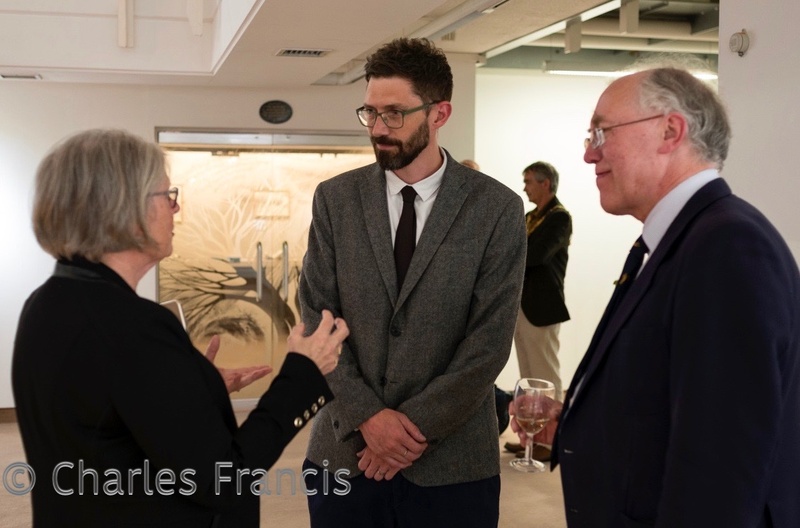 We had the pre-view on the evening of the 17th May, with speeches by the curator Richard Smith, myself and the opening of the exhibition by Professor Stephen Wildman. That in itself was a lovely event (I think!) and many of the exhibiting artists came along. www.britishbotanicalartists.com.The exhibition is on until 9th June 2018. 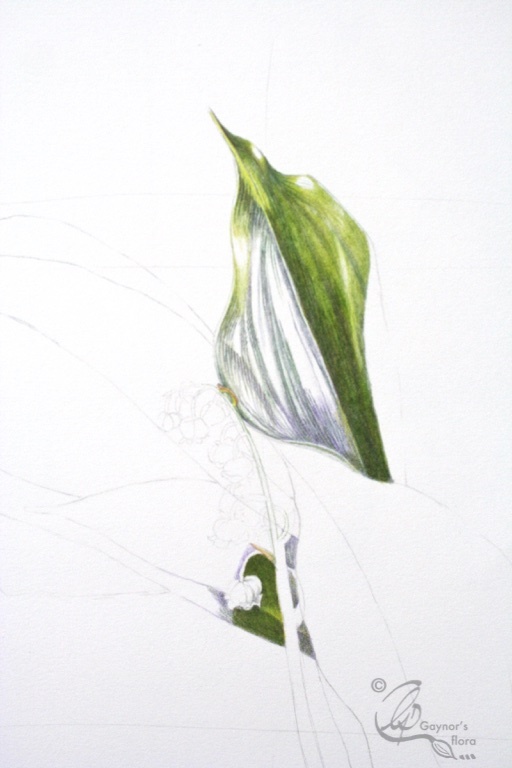 Generally botanical artists are there demonstrating and on the last day there will be a tour of the pictures and a talk. In between all of this I have managed to squeeze in the Chichester Open Studios weekends and I had quite a few interested visitors. Each evening though it was back to working until the early hours of the morning, on ‘In Ruskin’s Footsteps’. At Chichester Open Studios art trail, starting off the final work for a commission. A Bramley Apple in watercolour. To show you a little of my own demos whilst in Lancaster I am including the unfinished picture I worked on in coloured pencil. I chose a Lily of Valley as so many people worry about white flowers. I wanted to show how best to do it. I used a lamp to highlight from the left and some of the leaves became backlit creating a beautiful architectural plant. The picture will remain unfinished as the flowers are now long gone, but it will be useful to demo on. Sorry to have to bore you with this! WordPress already has a system in place that protects you if you have signed up to follow my blog. But if you would like emails directly from me about workshops and tuition, or information about my botanical art news in advance of exhibitions etc. then to hold your name on my mailing list I need your permission. My mailing lists are stored on my computer address system and on a MailChimp list. They are used solely by me and I do not give them to anyone else. Each link enrols you onto a different list, so if you want to hear directly from me about both my news and tuition opportunities , follow through with both of them. You can easily unsubscribe at any time. Thank you for reading this. < Goodbye to “Farewell” and hallo to another project start.